There are Many Myths About Mobile Develompent. Could Everything You've Heard About Mobile Development Be Wrong? Developing mobile apps is expensive, time-consuming, takes too long, requires hiring big-money mobile developers, and means you’ll have to use an entirely different set of mobile app development tools than for the Web, right? Wrong. Those are just some of the myths you’ll hear about mobile development. In this white paper, we’ll crush those myths and others, and show you how developing for mobile can be cheaper and easier than you think. 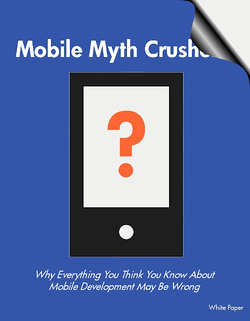 What mobile myths will we be crushing?